That’s not a typo - Madison and Althea met. It wasn’t exactly all that friendly. Madison wants the SWAT mobile and is willing to threaten murder to get it. Althea is unwilling to give up the SWATmobile and there’s lots of threats and stubbornness. Althea tries to jump Madison which doesn’t go well, because, well, Madison. She just wants Madison’s story - which Madison tells with a fake name. She speaks about wanting to create a place for her children, somewhere safe: the Stadium. Not just because it has walls but so they can all live without having to make these brutal choices. She even has a beautiful story of how kind and caring her kids where when they were children - and how much she wants them to stay that way. Althea sends her on her way - with supplies. Aaaargh this is a pet hate of mine. If you are shot you generally don’t need to remove the bullet (unless it’s pressing against something that you really don’t want it to press against). And if you’re only option for removing it is amature surgery in the back of a SWAT wagon without antiseptic or anaesthetic or surgical tools? Leave the bullet alone. Seriously. Let it be. Call yourself a cyborg. Give it a cute name. Just refrain from mutilating your body to remove a sterile, inert piece of metal. Althea: Hah my SWAT vehicle is like a tank!!!! Swat vehicle: door falls off. No, really, they kind of stop and Althea puts on her sad understanding eyes as Alicia hears her mother’s hope for her to live a life without having to kill all the things. She ends up crying and he hugs her while Naomi goes to heal John. And reveals her real name - June. Despite the whole RPG thing, this has brought everyone together in peaceful harmony and not murdering each other. All that attempted murdering has been put behind them. The gang was stuck in a car surrounded by zombies but Madison and Vincent charged out and saved them. The problem is that, without Madison to reassure them, everyone else in the Stadium lost faith in the walls keeping them safe. They ran in a caravan (which June managed to escape from -as did Mel and Charlie) and were duly surrounded and massacred. All the people Madison had brought to the Stadium to live died surrounded by zombies. Madison and the gang were also trapped - until Madison uses a flare. 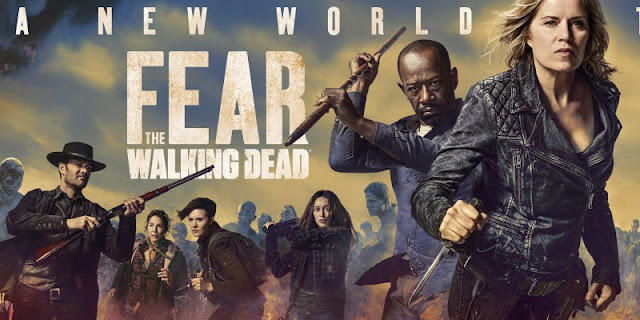 Drawing attention to herself, she goes inside the Stadium walls and traps the zombies inside with her to burn - saving Alicia, Nick, Victor and Lucinda by drawing the horde with her… but dooming herself. I’m not entirely sure how this ended up with everyone hating/blaming June beyond the fact she didn’t die at the Stadium because I don’t see why anyone would assume she did something wrong here? I can get Alicia loathing the Vultures - but hating Mel and June seems… dubious? Unless it’s because June then allied herself with the very people who destroyed them - but survivors gotta survive. And it sets everyone up to be together… because bygones?